I’ve been using Verbatim products, primarily their recording media, for many years. I’d always found their products to be reliable and priced well. Imagine my surprise when I found out that Verbatim also produces other items, such as the Bluetooth Wireless Notebook Laser Mouse. Most people still have had a tendency to use a USB mouse, plugging a wireless receiver into one of the USB ports. Well, when you’re using a MacBook, having only two ports can be a bit of a hindrance. 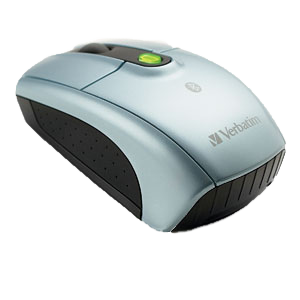 Verbatim’s Bluetooth Wireless Notebook Laser Mouse can help free up one of your USB ports and make your life a bit simpler. The mouse comes with a CD with application software (Mouse Agent) for both Mac and PC, 2x AA batteries and a Quick Start Guide. I unpacked the mouse, placed the two batteries inside, closed the lid, synced the mouse via Bluetooth with my MacBook, and I was off and running. Absolutely no problems whatsoever in using the mouse from the start. 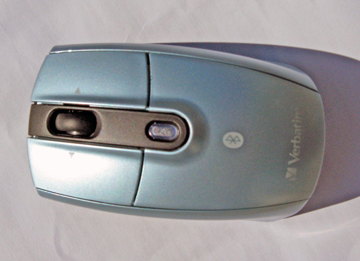 Right click usage was standard as with any other mouse, it responds quickly and did not suffer from any hiccups. 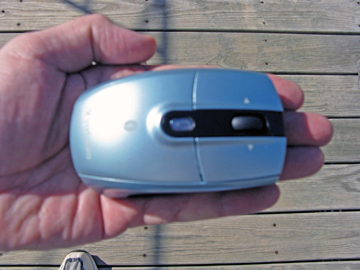 The mouse itself is approximately the same size as other notebook mice (3 5/8 L x 2 1/8 W x 1 1/4 H) and is easily held in one’s palm. Weight is negligible and it fits easily into any laptop bag when one is traveling about. The on/off button on the bottom of the mouse makes it easy to shut it off when one is done working on the computer and I noticed no unusual battery power loss issues if I left the mouse on for days while not using the computer. Scrolling left and right using the tilt wheel was a breeze, made page viewing very easy online without touching the keyboard or keypad. I’ve found the mouse to be easy to use, smooth and does exactly what it is supposed to do. Setup is a breeze, portability is not a problem, particularly since there are no wires/cables to dangle about. System requirements under Mac OS X is version 10.4 or higher. The mouse comes with a 1-year limited warranty. My Mac rating: 4 out of 5.